In Raiders of the Lost Ark, Indy has "the headpiece of the staff of Ra," which features writing in some language that he cannot read. He takes it to an interpreter with a big beard, who holds the headpiece up to the camera to give us a good look at the headpiece. The scene with the interpreter is here, helpfully supplied by @BrettFromLA. But this image is better for reading the writing, found at the Indiana Jones Wiki page. I wonder: what language is that? despite being implied in the movie to be Egyptian, the writing around the edges appears to actually be Hebrew. The script is related to ancient Phoenician, which was used for both Hebrew and even early Greek, but is called Paleo-Hebrew. Transliterated it reads: "v'amah achat m'al" "kadesh" "kabed YHWH v'hamiskhkan". Translated it reads: "and one amah (Which was a biblical measurement) above/more" "holy/set apart" "honor YHWH and the tabernacle". In the first place, the symbols don't match up. 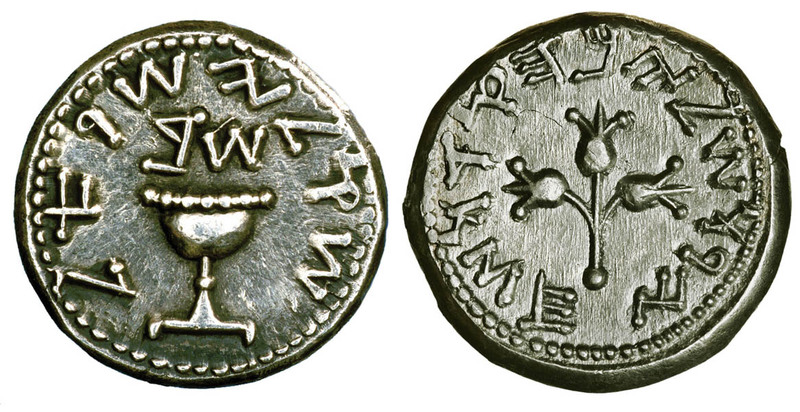 The symbols look something like this script, supposedly an alternative script for Hebrew. But they're not really the same. 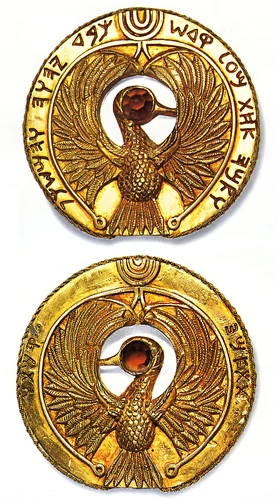 And there's no way to match up the headpiece symbols (cryptogram-style) to form the Hebrew words transliterated on the Indiana Jones wiki page. In the second place, it doesn't make sense for the message to be in Hebrew. The message was put onto the headpiece not by the Hebrews, but by whatever group of people captured the Ark from the Hebrews and buried it in Tannis. Also the message refers to "the Hebrew god whose Ark this is," obviously not the words of the Hebrews who know the God of the Hebrews as the one God of heaven and earth. So what would make sense? And can the writing in the photo really be read to mean what it means in the film, the description of the staff useful in finding the hidden Ark? Yes, that script absolutely Paleo-Hebrew. I recognized it instantly when re-watching the movie recently. But what is Hebrew doing on an Egyptian artifact? It’s a goof! There’s no good explanation for it. There are a lot of problems here, but someone clearly did some research to make this. That makes it even more bizarre that Hebrew was chosen, rather than Egyptian! Besides the fact that this doesn’t match what is said in the movie, the most obvious problem to me is using the gematria system to indicate 400 cubits (which is already an absurd height) by writing ‘תת’. This is anachronistic by several centuries. For more information (and more errors), see the article ‘So How Tall is the Staff of Ra?’. Why does the Ark burn the markings off its crate? Has the authenticity of the Raiders story conference transcript ever been determined?